When I visited Breckenridge, Colorado a few years ago, I lived on Breckenridge Breweries offerings the entire week I was there. They had a brewpub right in town that we frequented often. I seem to remember those beers actually being quite good (and very fresh) but all of their offerings I have had so far have not lived up to my memories. I must admit, I was in my infancy when it came to craft beer back then and I was looking for something similar to my Holy Grail of beers at the time, Fat Tire. Lets see if tonight’s beer will live up to those memories or will it fall to the wayside of many an empty bottle I have in my basement of sub-par beer. Appearance – Dark brown with no head whatsoever. Nose – Pretty faint but I did get some roasted malts…a bit like coffee. Taste – Coffee was the most recognizable flavor here. It had a smoky & nutty quality to it also. It was really all about the malts here…hops be damned. It had a chocolate finish and aftertaste to it. In a weird way it reminded me of Indian Corn, a take on Candy Corn but with chocolate…I know, weird. Mouthfeel – Lighter than it looked in the body with low amounts of carbonation. It was creamy and very smooth. Overall – Pretty average…there are much better beers in this style. 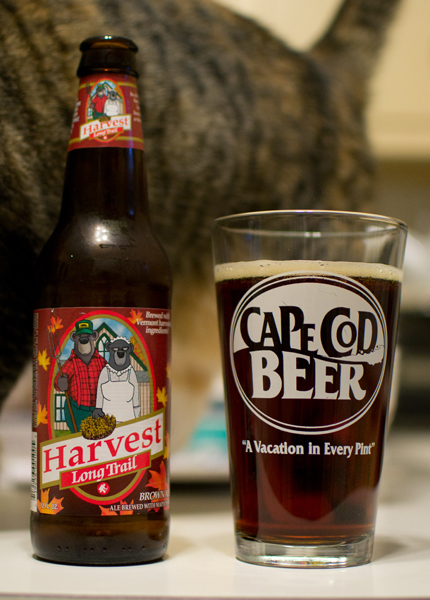 Beer #327 is Harvest by Long Trail Brewing Company. 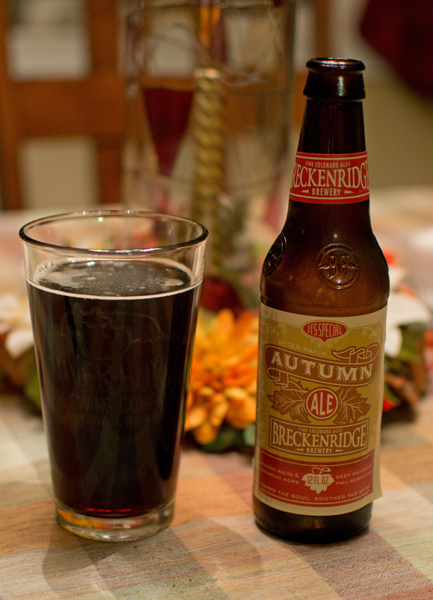 This American Brown Ale with an ABV of 4.6% is brewed in Vermont. Appearance – The color of brown, nice and clear, with a small cream colored head. Nose – Very malty…caramel and a toasted bready aroma. There was also a very slight maple aroma buried in there too. Taste – Caramel and toast make up the majority of the flavors. There was kind of an earthy nutty thing here also. Mouthfeel – Medium bodied with mild carbonation. Overall – An average American Brown Ale with the added bonus of maple syrup even know that didn’t translate to the taste. 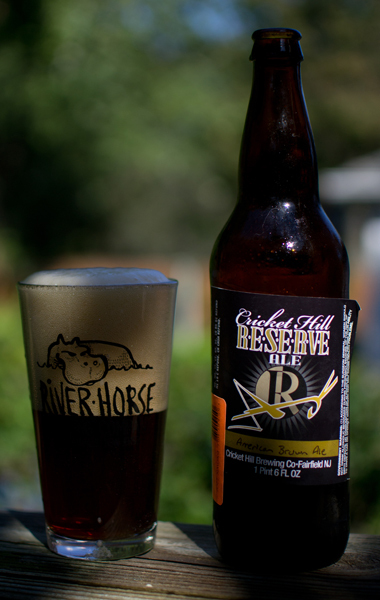 On to beer #315, Reserve Ale American Brown Ale by Cricket Hill Brewing Company. Their version of an American Brown Ale, brewed in Fairfield, New Jersey, has an ABV of 5.7%. I poured this outside on this beautiful autumn day. The color was a clear brown with just a hint of red to it. The cream colored head was huge and started to overflow the glass. It left some of the best lacing of any beer I have had. The nose was a bit light with caramel, a nutty aroma, and some grassy hop scents. It had a slightly sweet caramel malt taste with a bit of pine from the hops. There was a bit of a nutty almost earthy flavor also. To be honest, the flavor was a bit ho-hum. The body was just south of medium with average carbonation. It was fairly smooth and almost creamy. This was better than yesterdays Cricket Hill Reserve series but not by much. Oh well…enough of sitting in front of the PC…time to get outside an enjoy the day! Beer #247 is Indian Brown Ale by our friendly brewers Dogfish Head from Milton, Delaware. This American Brown Ale has an ABV of 7.2%. 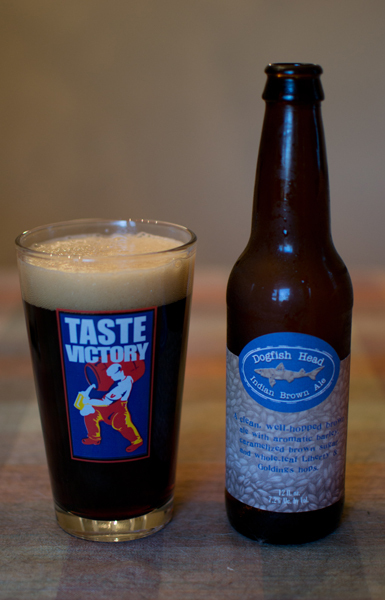 Yikes…a Dogfish product in a Victory glass…oh well…I’m sure neither will mind. The appearance of the brew was dark brown with a nice frothy tan head. Roasted malt & chocolate filled my nose with some nice aromas with just a touch of brown sugar. I also picked up bread…similar to pumpernickel. The taste opened with a sweetness and then something I didn’t get in the nose, hops in the form of pine. It got malty mid-mouthful with a roasted, chocolaty flavor with an ever so slight smokiness. It finished up with a light and sweet coffee flavor. The body was medium and it had a nice amount of lively carbonation. This was a really delicious brew from Dogfish! If you are into American Brown Ales, give it a try! KingBob tested, KingBob approved! Beer #168 sounds like an ode to Primus and their song Wynona’s Big Brown Beaver which I quoted above. 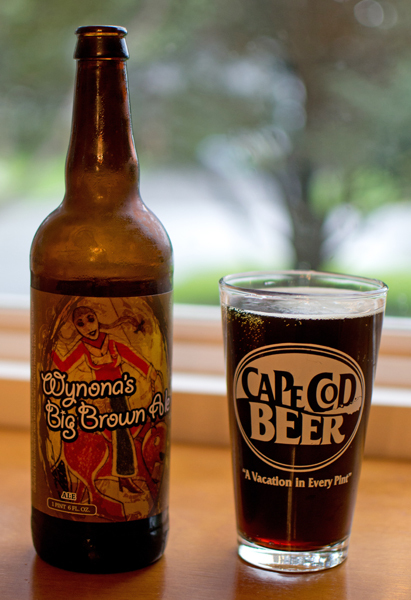 Wynona’s Big Brown Ale by Voodoo Brewing Company (Meadville, Pennsylvania) is an American Brown Ale with an ABV of 7.3%. Indeed, according to the bottle the brewers at Voodoo were inspired by the Primus song and brewed a beer in honor of it. I love the label on this with women (Wynona I assume) mounted on a big brown beaver riding it…cool! This Brown Ale was indeed a very dark brown which was nice but it didn’t have any head which isn’t so nice. I need to learn how to pour a beer…I think my lack of skills impacts the head quite a bit. There were some nice roasted and nut like aromas coming from the glass. It had a nice semi sweet flavor with hints of coffee and chocolate. There was a bit of bitterness here mostly towards the end of the sip and lingering on in the aftertaste. The mouthfeel was a bit on the thin side with a bunch of carbonation. It was very easy to drink the bomber. This beer was solid. It was pretty tasty and smelled good. I wouldn’t hesitate in picking this up again. And what better way to finish this off than to quote Primus one more time. 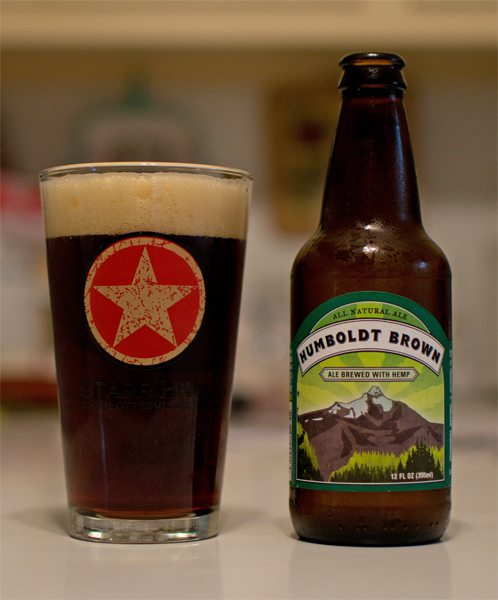 A ho-hum, day brings me to beer #148, Humboldt Brown by Nectar Ales from Paso Robles, California. This interesting American Brown Ale is brewed with hemp. It has an ABV of 5.7%. Hemp as you may or may not know is the soft fibers that comes from plants in the Cannabis family. Cannabis…interesting. Another interesting note is that hemp contains less than 0.3% THC. THC is the stuff in marijuana that makes one wacky. Alcohol and THC…okie dokie now. It had a nice brown color with a very nice tan head. The aroma was very floral and clean (don’t ask me to describe clean…that was just the first thing I thought of on taking a whiff) would be the best way to describe it. There was a bit of a semi sweet roasted malty thing going on in the taste. It also had an iced tea like flavor…odd. I could only assume that was the hemp. It had a nutty aftertaste that lingered on for quite some time. It was pretty light in the body with a nice amount of carbonation to tickle the tongue. Easy drinking was this brew…5.7% ABV you say…I couldn’t find it. Alas…an average beer at best for this ho-hum day. I guess the hemp would be the thing that lures one into trying this, it did for me…along with the cool bottle cap which depicted three hummingbirds. Onwards to #149. Happy Easter to any who celebrate today! And a beautiful Spring day it is…good enough to break out a lawn chair and drink this brew in the great outdoors of my front yard. 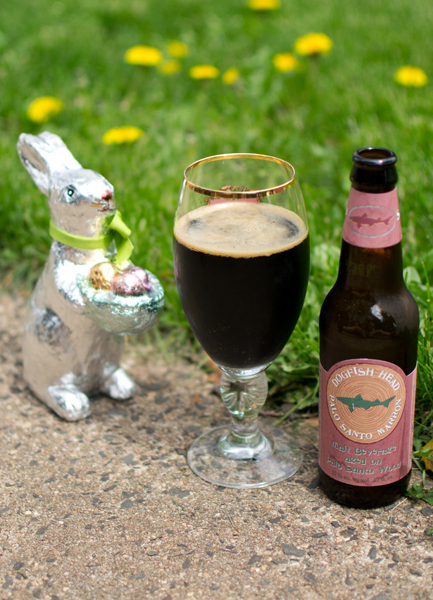 Why look who made an appearance into beer #147’s photo, the Easter Bunny. Cute little fellow…no? Palo Santo Marron by Dogfish Head is an American Brown Ale with a killer ABV of 12%. It is aged in Palo Santo wood barrels from Paraguay…I have no idea what that is…but sounds interesting to me. Another dark beer was this…dark brown…almost black. There was a tan ring around the top that could be considered the head. Wow…heavy malts from the nose along with molasses. Strangely for the high alcohol content, there was no indicator of it in the nose. The taste was again heavy dark roared malts, caramel, a bit of vanilla (stronger as it warmed up), sort of sweet (almost to the point of being sickening), and a smoky presence (must be from the Palo Santo wood). It had a nice warming sensation from the high alcohol content. It was a bit on the heavy side coating the mouth and tongue. It was a sipper for me for sure partly because of the high alcohol but mostly from the peculiar sweetness that doesn’t always sit too well with me (similar to how barleywines affect me). Not a bad brew…just not one of my favorites from Dogfish. It was quite enjoyable to drink this outside today on this very beautiful relaxing day.